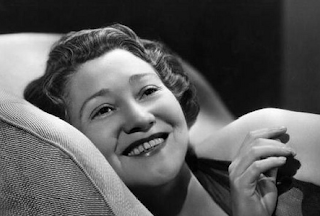 Fay Bainter first appeared on stage at the age of 15. Two years later she was touring in a show, and by age 19, she was on Broadway. She didn't reach Hollywood until she was in her early 40s, when MGM cast her in a 1934 motion picture that quickly cemented her status as a reliable character actress and occasional lead. Within four years, she had earned an Oscar for her supporting work in JEZEBEL, the same year she was also nominated as best actress for WHITE BANNERS. For the next fifteen years, she remained highly in demand, working for most of the major studios and independent producers like Sam Goldwyn, who cast her as Danny Kaye's mother in THE SECRET LIFE OF WALTER MITTY. Her last film was 1961's remake of THE CHILDREN'S HOUR, for which she was again nominated as Best Supporting Actress. In later years, she turned up as a guest star on television programs hosted by Alfred Hitchcock and Bob Hope. Fay Bainter present and accounted for..! TopBilled, I love Fay Bainter! I'm so glad you have brought attention to her fine acting skills. Those eyes that could express a million emotions. When I see her onscreen, I almost feel like she was a member of my family. All her performances are sublime, and in the last version of the Lillian Hellman tale, she was superb as the unseeing grandmother to that brat! Seems like long ago I also saw her in "Mrs. Wiggs of the Cabbage Patch" where she had to contend with W.C.Fields and anyone doing that should win an award. Great tribute to a lovely lady of the screen, TB! Thanks. She's very good as the selfish daughter of Victor Moore & Beulah Bondi in MAKE WAY FOR TOMORROW. And she's a hoot in the crime comedy THE LADY AND THE MOB. 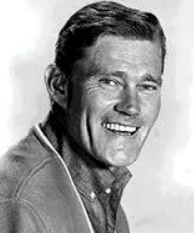 Chuck Connors was a professional athlete before he came to Hollywood. He played pro basketball for the Boston Celtics and pro baseball for the Chicago Cubs. His athleticism and desire to break into the movies made him a perfect choice for a role in MGM's sports comedy PAT AND MIKE alongside Katharine Hepburn & Spencer Tracy. This led to another sports-themed film, TROUBLE ALONG THE WAY (about football) with John Wayne. Soon, Connors was fielding offers to appear in other motion pictures, and not long after that, he found the role of a lifetime on an iconic western TV series. 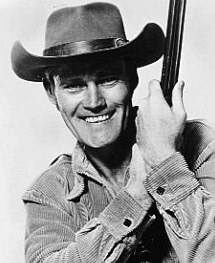 In 1958, he began playing Lucas McCain on the highly rated program The Rifleman, which made him a household name. After the weekly series ended in 1963, Connors was back in movies more regularly. Film roles in the 60s included playing Doris Day's shipwreck companion in MOVE OVER, DARLING; and as the father of Luke Halpin in the very first FLIPPER movie. 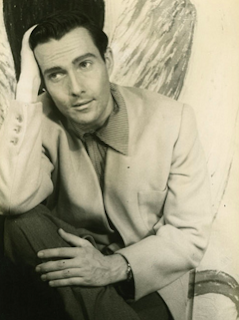 As the 60s continued, Connors took on another weekly television series, but he also kept making movies. His stardom never faded, probably because The Rifleman retained its popularity in syndication. But unlike other typecast western actors, he was able to find a lot of work in his later years. In fact, he would never officially retire, turning up in films and television programs for the next two decades, with his last appearance in 1991, the year before his death. Lucas McCain Chuck Connors present and accounted for..! 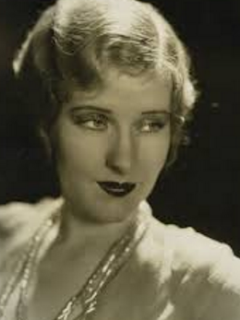 Fay Bainter was one of those solid as a rock supporting actors; She really helped ground many of the films she was in and added quality support to the star. Jezebel being just one example. Bette's scenes with Fay are some of the best in the film. There are many other examples of her high quality work at Warners as well as other studios. What I like about her is that she could do any kind of character in any sort of film at any studio. She has a thankless role in a Mickey Rooney/Judy Garland film but she makes it work. She also does a wonderful job as the title character in THE WAR AGAINST MRS. HADLEY. Then we see her as Danny Kaye's mother a bit later, and she's back at Warners in the rural drama DEEP VALLEY, as Ida Lupino's mother. She was versatile, playing off all kinds of people in these roles. If she started on stage at 15, and didn't get to Hollywood until she was 41, then she had over 25 years to perfect her skills as an actress. And it shows on screen just how good she was, no matter what the part or genre might have been. 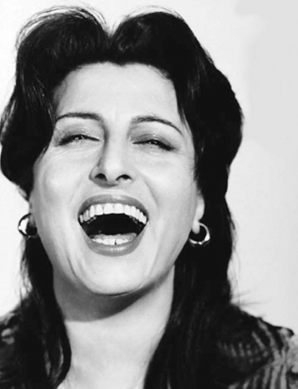 Anna Magnani was already making a name for herself in Italian movies in the late 1930s and 1940s, mostly in comedies and historical dramas. But it wasn't until she was cast in a segment of Roberto Rossellini's neorealist classic ROME OPEN CITY that she found international success. From 1945 onward, the actress was a much beloved figure of world cinema, continuing to make films in her native Italy, as well as in Hollywood and France. Her first stateside production was for producer Hal Wallis, in 1955, as the lead of the film version based on Tennessee Williams' stage hit THE ROSE TATTOO. Anna earned a Best Actress Oscar for that lively performance, and she would do another film based on a Williams play a few years later, THE FUGITIVE KIND. But it was probably back on her home soil where she felt most comfortable and where she turned in some of her grandest performances during the later years of her career. Check her out as the title character in MAMMA ROMA, and opposite Anthony Quinn in THE SECRET OF SANTA VITTORIA. Nobody else dominated screen proceedings with such gusto. 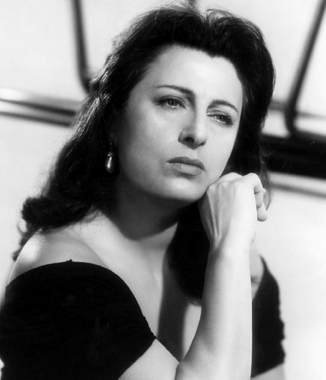 Anna Magnani present and accounted for..! 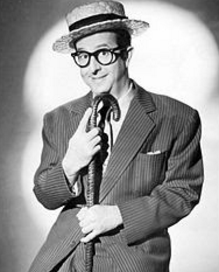 Phil Silvers began to appear in movies in 1940, and during his first year in Hollywood, he usually had small comic relief parts. But he quickly worked his way up to supporting roles and found steady employment during the 40s at various studios. In fact, he turned up frequently in musical comedies for Columbia and 20th Century Fox. By 1950, when most stars were transitioning to television, Phil went east and scored a triumph in the Broadway production of 'Top Banana,' earning a Tony award. This brought him back to Hollywood in the 50s to star in the film version, and he also was given a sizable role in a Doris Day picture at Warners. Not long after this, he did transition to television full-time, where he was featured in his own self-titled weekly sitcom. It was a hit with audiences and ran for four seasons. After The Phil Silvers Show ended, the iconic comic actor again returned to Broadway. He was praised for another Tony-nominated performance in 'Do Re Mi' with Nancy Walker. Afterward, there were notable guest appearances on TV in the 60s and 70s, and Phil also continued to appear sporadically in motion pictures. He played a secondary role in A FUNNY THING HAPPENED ON THE WAY TO THE FORUM, then assumed Zero Mostel's lead role during the early 70s for a Broadway revival, which netted him another Tony award. In later years, his health declined but before his death he had a memorable turn playing the father of his daughter Cathy's character on the long-running series Happy Days. Phil Silvers present and accounted for..! 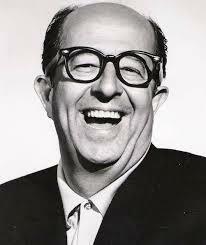 TB, I adore Phil Silvers! Thanks for giving him credit that is so richly deserved for being such a unique film character. He might be a bit more known for his work as Bilko on tv, but I always enjoy his movie roles. I love how he is able to take otherwise insignificant parts (in his early movies) and insert them directly into the action. He sort of specialised in pushy fast-talkers. He's particularly hilarious as a bus tour guide in A LADY TAKES A CHANCE, where Jean Arthur travels across the west and meets cowboy John Wayne. Phil nearly steals the picture out from under the leads. Frances Langford was a bigger star on radio than she was on screen, though she did appear in a variety of musicals during the 1930s and 40s. Since she did not have a long-term contract with any one studio, she sort of bounced around, turning up in productions at Republic, PRC, Hal Roach Studios and RKO. Her work at RKO, in particular, came near the end of the war, when Langford was in-between USO tours. They usually paired her with well-known radio announcer Ralph Edwards. Edwards would, of course, become famous as the host of the TV's popular biographical series This Is Your Life. Together, Langford and Edwards costarred in RADIO STARS ON PARADE; BEAT THE BAND; and THE BAMBOO BLONDE. All were hits with audiences of the mid-40s. 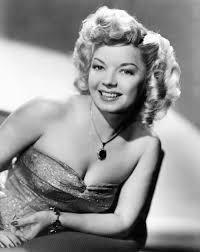 Frances Langford & Ralph Edwards present and accounted for..! Thank you for honoring Phil Silvers. Phil got his start in burlesque. What made him so great on live TV and on Broadway is that he was considered to be the greatest ad lib comedian in burlesque. And if that wasn't enough, he danced alongside Gene Kelly in the musicals. What a guy, what a talent! You're welcome, Princess. Yes, I did read about his dancing with Gene (in COVER GIRL). One comment I found about Phil Silvers is that on the audio commentary for one of his films of the 1960s, I believe it was IT'S A MAD MAD MAD MAD WORLD, someone who worked on the set said all those other guys like Jimmy Durante and Milton Berle were traditional comedians, cracking jokes in between takes. But apparently Phil was not a traditional comedian but rather a comic actor, and his off-camera/off-stage demeanor was rather serious. A few years back, I had read that about Lucille Ball, too. Interestingly, Phil's role in TOP BANANA is supposedly based on Berle. And that makes sense, that a comic actor could essay a comedian. I sincerely doubt Berle could have dramatically played the life of a comic actor, though in his later years Berle did venture away from comedy a bit more. But that seems like a whole other subtopic (an intriguing one to be sure). Saturday January 23rd: Two Paramount stars romantically teamed on screen a few times in the early 50s. Sunday January 24th: Legendary ladies from the silent film era that had mixed success when sound came in. Monday January 25th: Dorian Gray. Tuesday January 26th: Stage actress of the 1920s who came to Hollywood later in the decade and was called one of the ten most beautiful women in the world. Wednesday January 27th: A David Selznick discovery who started in melodramas but quickly found his niche in westerns. Thursday January 28th: A vaudeville talent who appeared on screen for over 65 years. Friday January 29th: Adam & Amanda/Pat & Mike. In the early years of his motion picture career, William Holden's contract was shared between Paramount and Columbia Pictures. He was featured in hit films for both studios, but perhaps his biggest success came in 1950 when he was cast in Billy Wilder's SUNSET BOULEVARD. Though a large part of his screen time occurred opposite Gloria Swanson, another actress was cast as his character's true love interest. Her name was Nancy Olson, and she had recently signed with Paramount. Their chemistry and easy rapport was obvious, and quickly Paramount reteamed them as romantic partners in several more pictures. Over the course of the next eighteen months, they did three more films together. The first one was the classic noir UNION STATION, where a woman (Olson) helps police thwart a kidnapping on a train; it was directed by Rudolph Mate. The next one was John Farrow's SUBMARINE COMMAND, released in 1951, with Holden as a vet reminiscing about his adventures at sea during the war, with Olson playing the girl in his life. And later that same year, the duo turned up in FORCE OF ARMS, another war film, this time directed by Michael Curtiz. 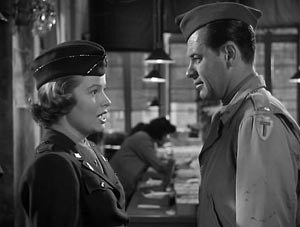 Holden played an army sergeant and Olson was the WAC lieutenant he romanced in Italy. 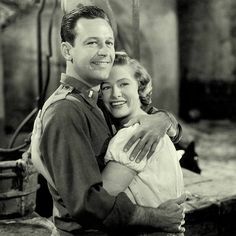 Nancy Olson and William Holden present and accounted for..! The transition to sound in the late 20s and early 30s was often a career ender for top stars of the silent film era. The reasons for this are numerous, but for every dozen failures to transition there's one or two that managed to survive, albeit somewhat changed. Leading ladies Mary Pickford and Lillian Gish seem to fall into this category. Pickford made a few talkies, and in one case, she was awarded a Best Actress Oscar (for her boiling performance in COQUETTE). But after she made another sound film which costarred Leslie Howard, Pickford decided to retire from acting. However, she maintained an active role as a producer in Hollywood for many years and did entertain thoughts of a comeback as late as the early 1950s. Lillian Gish's path was a bit different. She had a starring role in an early sound picture (ONE ROMANTIC NIGHT), but there were gaps between screen appearances and by the 1940s she was largely playing supporting roles. She would turn up in memorable character parts until the 1980s, when in advanced age, she costarred in Lindsay Anderson's THE WHALES OF AUGUST. Mary Pickford and Lillian Gish present and accounted for..! 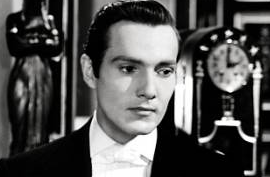 Hurd Hatfield's most important role occurred when he was cast in MGM's 1945 version of THE PICTURE OF DORIAN GRAY. A year earlier, he had portrayed a Chinese peasant in DRAGON SEED and had gone virtually unnoticed. But as Oscar Wilde's vain alter ego, he was oddly glamorous and made quite an impression. The actor catapulted to fame, but he was quickly typecast. He turned up in other hit films during the late 1940s and early 1950s, but would eventually transition to television. And TV assignments kept him busy well into the late 1980s. There was an Emmy nomination along the way, and a few times he even appeared on Murder, She Wrote with former costar and lifelong friend Angela Lansbury. However, it was his passion for collecting antiques that took up a considerable amount of time during the later years of his life. No word on whether he had any Victorian portraits in his collection. Hurd Hatfield present and accounted for..! 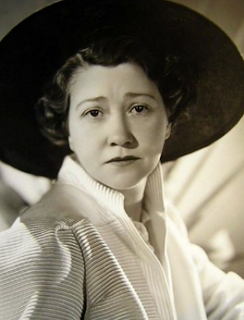 Catherine Dale Owen made a name for herself on the Broadway stage during the 1920s. As a result of her success, she was wooed by Hollywood studios to head west and try her luck in the movies. It didn't hurt that she was one of the most photogenic actresses of her generation, and when she arrived in the motion picture capital, she was promoted as one of the ten most beautiful women in the world. 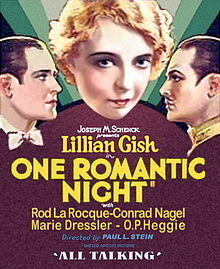 Her first sound film in 1929 paired her with John Gilbert. Follow-up assignments cast her opposite other leading men of the day, including Warner Baxter, Paul Cavanagh, Edmund Lowe and Ricardo Cortez. But while Owen's movie career took off quickly, it was rather short lived. In 1931, she returned to the stage and four years after that, she retired from acting altogether to focus on marriage and motherhood. Catherine Dale Owen present and accounted for..! 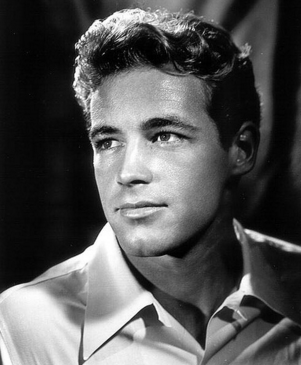 Guy Madison was placed under contract to David Selznick, hired because of his dashing good looks and the idea that Selznick could turn him into a major star. In the post-war years, there were assignments in romantic comedies like TEXAS, BROOKLYN AND HEAVEN with Diana Lynn and HONEYMOON with Selznick's other young star Shirley Temple. An attempt to use him in melodramas like TILL THE END OF TIME and DRUMS OF THE SOUTH met with mixed results. 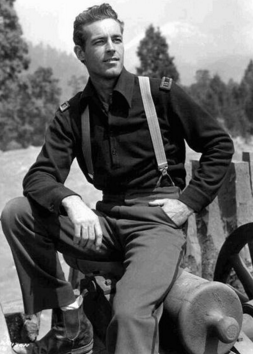 But after studying his craft at the La Jolla Playhouse and venturing into television in the 1950s, Guy Madison began to find his niche in westerns. He had a long-running role on the weekly series The Adventures of Wild Bill Hickok. To capitalize on his TV stardom, Warner Brothers and Columbia hired him throughout the decade to star in routine western films that paired him with pretty starlets and were a hit with audiences. There was also the occasional prestige picture, such as one he did with Jean Simmons for 20th Century Fox called HILDA CRANE. In the 1960s and early 1970s, he continued to work in different genres but found his greatest opportunities in spaghetti westerns. Guy Madison present and accounted for..! 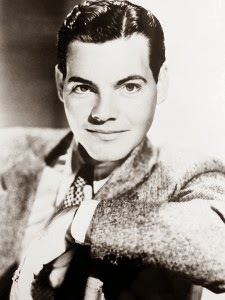 Eddie Quillan was like other entertainers from his generation, in that he started as a kid on vaudeville and used the skills he had developed on stage to forge a career in movies. 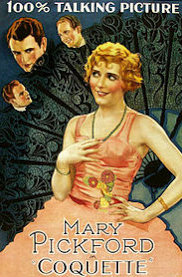 In 1922, he began making silent films for Mack Sennett. He also found work with Cecil B. DeMille. By the late 1920s, he landed a contract with Pathe (which was absorbed by RKO). Initially, he had leading roles, mostly in comedies. 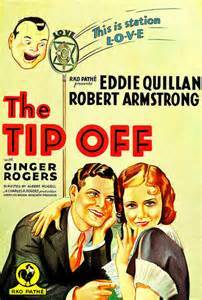 One of his leading ladies was Ginger Rogers in 1931's THE TIP-OFF. Throughout the first half of the 30s, he continued to play lead and top supporting roles but by the end of the decade, he was cast more often than not in smaller but yet important character parts. A noteworthy assignment came his way for John Ford in 1940's THE GRAPES OF WRATH. But Eddie's versatility and ability to do comedy and song-and-dance routines made him a logical choice for more lead roles in the 40s at poverty row studios like Monogram. In the 1950s he transitioned with ease to television and played a variety of parts on the small screen. He was still working on TV in the 1970s and 1980s. For example, Michael Landon cast him often on Little House on the Prairie, usually in different roles. He was still being called to do showy character parts on Landon's next series Highway to Heaven. By the time Eddie died in 1990, he had proven that he had what it took to maintain a long career in show biz, something lesser talents could not achieve. Eddie Quillan present and accounted for..! Spencer Tracy was not a conventional leading man in Hollywood. He didn't look like the romantic stars that swept women off their feet in movies, and he certainly didn't act like them. He had a style all his own. He had started at Fox with the advent of the talkies, and he remained with the studio until it merged with 20th Century Pictures. Then in the mid-30s, he moved over to MGM where he would have some of his greatest successes over the course of the next twenty years. Meanwhile, there was a stage-trained young actress making a name for herself at RKO in the 1930s. 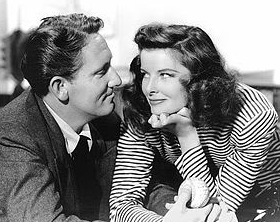 Katharine Hepburn proved how talented she was in such vehicles as MORNING GLORY and STAGE DOOR, where interestingly she played headstrong actresses not too unlike her real-life self. By 1940, Kate had gone over to MGM bringing her hit stage success in 'The Philadelphia Story' to the screen. A short time later, someone had the wonderful notion of costarring her with Spence, and the rest was history. From their first picture together, WOMAN OF THE YEAR in 1942, up through 1967's GUESS WHO'S COMING TO DINNER, these two displayed a sort of chemistry and magic that just could not be faked. Altogether, there were nine Tracy-Hepburn movie collaborations, and in their own individual ways, they are all classics. 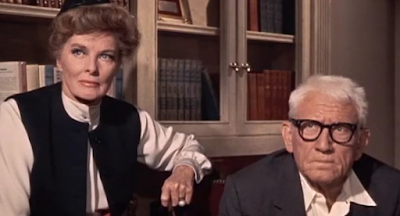 Katharine Hepburn & Spencer Tracy present and accounted for..! Another thing to look for in GWCTD. for any art aficianado is the Margaret Keane, Big Eye painting. Being that Kate is supposed to be involved with an art gallery of contemporary art, supposedly there is a Keane somewhere on the walls in this film. Looking for it though, is like trying to find Billy Gray in "Some Like It Hot". Interesting. Thanks for the reply. Sometimes when I write these little blurbs, I have to edit and re-edit them to get them 'just right' as Goldilocks might say. But when I sat down to write the one on Tracy & Hepburn, I made zero edits. It was the easiest one I've ever written! Saturday January 30th: RKO's answer to Laurel & Hardy in the 30s. Sunday January 31st: A pair that teamed up twice, in a gangster drama and a musical biopic. Monday February 1st: Bogart's third wife. 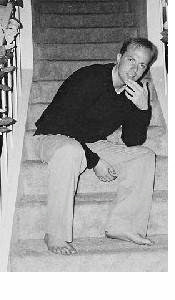 Tuesday February 2nd: Good looking leading man at Universal in the 50s. Wednesday February 3rd: Mrs. Danvers. Thursday February 4th: Lead in several science fiction classics of the 50s who became a character actor. Friday February 5th: Older screwball couple of the 30s & 40s. 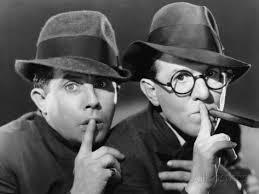 Bert Wheeler & Robert Woolsey, who were more commonly known as Wheeler & Woolsey, made a series of hit comedies for RKO. 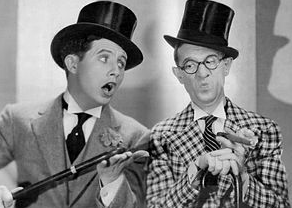 Like most comedians of their generation, they got their start in vaudeville before hitting the big screen. The duo's first motion picture assignment was to provide comic relief in 1929's RIO RITA starring Bebe Daniels. They were a success and the studio quickly launched a series of vehicles that made them very popular with audiences throughout the 1930s. They appeared in over 20 such films. In 1931, RKO cast them each separately in their own solo films (TOO MANY COOKS for Wheeler and EVERYTHING'S ROSIE for Woolsey), but all their other pictures were done together. They continued until Woolsey's illness in 1937; he died the following year. Wheeler went on to make two more films without him, but the old magic was gone. Wheeler, who lived another thirty years after his partner's death, found work on radio in the 40s and on television in subsequent decades. Wheeler & Woolsey present and accounted for..!